There is something about the role of the Classical Conductor that is unparalleled anywhere in the arts. Some might say a lead singer in a rock band takes centre stage and gets far more adulation but they don’t have the same responsibility for coordinating and leading an orchestra behind them. A film director has a similar role but they don’t stand up in front of a film in full view of the audience. The conductor performs a Jupiterian role as evidenced by Capricorn Research’s Jupiter / Saturn index which sees them 4th in the table. It is however, a very controlled Jupiterian presence which certainly doesn’t want to directly attract and focus the attention of the audience unlike the rock singer. The essence of the conductor’s role is as a leader and director but the image portrayed is controlled with the emphasis on the whole structure of the orchestra rather than the individual. A natural astrological depiction of the classical conductor would be the Sun in Aries with Capricorn rising. The research backs this up, in a sample of 123 Classical Conductors the most common Sun sign with 146% of the average figure is Aries and by some distance the top scoring Ascendant sign relative to the expected frequency is Capricorn with over 150%. One of the most famous British conductors was Sir Adrian Boult who had the Sun in Aries and Capricorn rising with Jupiter exactly conjunct the Ascendant. Jupiter’s prominent placing pointed to the fact that Boult was a conductor by royal appointment having led the orchestra for the coronations of both King George VI and Queen Elizabeth. It seems very appropriate that Boult’s Sun is in the 3rd house as this is the house of communication. Both the third sign Gemini and its planetary ruler Mercury communicate extensively through movement and gesticulation and what better placing for someone who leads others by waving his arms around than the Sun in Aries in the 3rd house. Besides the Aries / Capricorn / Jupiter influence, a conductor’s skills are many and varied. There has to be a sensitivity and feel for the music combined with an ability to keep in balance all of the various parts of an orchestra. So to have the Moon in sensitive water sign Cancer particularly on the 7th house cusp, a placing that is all about balance and harmony would be a great help. Aries, Cancer and Capricorn are all very different signs. They are active Cardinal signs but they pull strongly in different directions as they are Fire, Water and Earth. 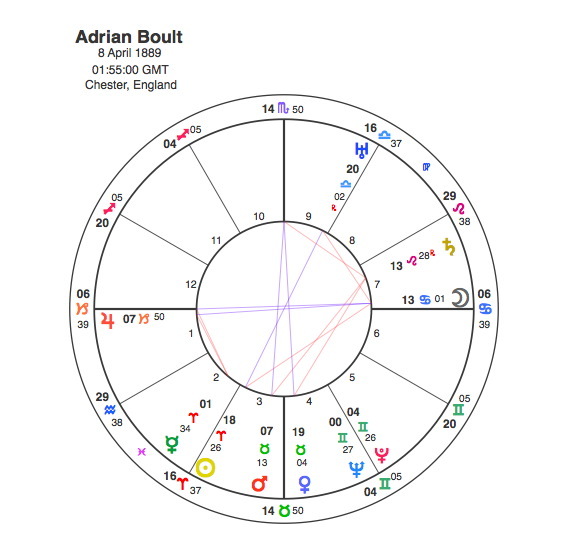 Adrian Boult has the Sun in Aries, Moon in Cancer and Ascendant / Jupiter in Capricorn and all of these are in square aspect to each other ( the Sun to Jupiter and the Ascendant is a wide square but this is drawn closer by the Moon’s involvement ). So all of these different skills and attributes are there in his chart but because they are pulling in different directions it means a lot of energy is spent in attempting to integrate all of them. As is often the case with people with square aspects, Boult was certainly a high achiever in his field and his career spanned a period of more than 50 years. To cap this Boult’s Sun is in opposition to Uranus in the 9th house as part of a T Square to the Moon. Uranus rules the media and its placing in the 9th house of long journeys would indicate that his media exposure would be world wide. The major events of Adrian Boult’s life occurred as Pluto transited his T Square. Boult’s first prominent post was conductor of the City of Birmingham Orchestra in 1924 when Pluto was conjunct his Moon. The real breakthrough and ultimate watershed of his life occurred when the BBC appointed him director of music in 1930 and he established the BBC Symphony Orchestra and becoming its chief conductor. Pluto was square both the Sun and Uranus from 1929 – 1932 so he suddenly ( Pluto ) became the leader ( Sun in Aries ) of the most significant media ( Uranus ) orchestra in the world ( 9th house ). This Pluto transit to his T square had another major effect, however. For many years, Boult had been a close friend of the tenor Steuart Wilson and his wife Ann. When, in the late 1920s, Wilson began to mistreat his wife, Boult took her side. She divorced Wilson in 1931. Boult was notoriously shy with women, which is hard to fathom for someone with the Sun in Aries opposite Uranus and Jupiter exactly on the Ascendant. Its perfectly understandable when we see the shy, retiring sensitive Moon in Cancer, one of the most introverted placings in Astrology, in the 7th house of relationships. This is one of the endearing fascinations of Astrology, how people can be one thing in one area of their life but something completely different and even opposite in another. The fact that Boult’s Moon was in square aspect to his Sun and Uranus and in opposition to his Ascendant and Jupiter showed how apparently at odds with the rest of his personality this was. The one thing about a Cancer Moon is its strong desire for a family and its natural maternal instincts to provide support and nourishment to those in its care. In 1933 Boult married Ann becoming a much-loved stepfather to her four children and the marriage lasted for the rest of his life. The T Square always brings a level of difficulty and Uranus’ part in this saga was the ending of the friendship with Wilson. The enmity these developments provoked with the singer had repercussions in Boult’s later career. The stigma attached to divorce in Britain in the 1930s affected Wilson’s career and he was barred from performing in English cathedrals at the Three Choirs Festival. As well as the Moon, Boult also had Saturn in his 7th house which would reinforce his shyness and reserve in relationships but would also add to the sense of security and longevity that he would bring to this area of life. Saturn in the 7th can bring difficulties, however and Boult experienced problems when Pluto came to conjunct Saturn in 1948. When he was appointed in 1930, Lord Reith had informally promised Boult that would be exempt from the BBC’s rule that staff must retire at age 60. However, Reith had left the BBC in 1938 and his promise carried no weight with his successors. In 1948 Steuart Wilson was appointed head of music at the BBC and he made it clear from the start of his appointment that he intended that Boult should be replaced as chief conductor and used his authority to insist on Boult’s enforced retirement. Jupiter’s prominence in Boult’s chart gave him the royal seal of approval. In 1937 Jupiter returned to its natal position and made aspects to his Ascendant, Sun, Moon and Uranus as he was rewarded with conducting the orchestra for George VI’s coronation and a knighthood. The coronation was one of the first outside TV broadcasts ever done and Boult was beamed around the world. The coronation of Queen Elizabeth in 1953 reached an even bigger audience and this was reflected in Boult’s transits by Uranus ( the planet of the media ) being in square to his Sun. On leaving the BBC, Boult took on the chief conductorship of the London Philharmonic. The orchestra had declined from its peak of the 1930s, but under his guidance its fortunes were revived. He worked with many major orchestras until he finally retired in 1978 at the age of 89 with Pluto opposite his Sun. Sir Adrian Boult had a truly Jupiterean career and his name was synonymous with the art of conducting. His birth chart clearly shows why.